Sulfur hexafluoride (SF6) is a gas widely used in switchgear in power plants, and the electricity transmission and distribution sector for its first-rate dielectric properties. This gas is an excellent insulator, up to three times better than air and nitrogen, and it works as an efficient arc quencher during switching processes. Switching releases large amounts of energy that are absorbed by breaking the SF6 into its components, sulfur and fluoride, which recombine after a short time to form SF6 again. All switchgear that uses SF6 as an insulator is tightly sealed. However, over the average 30-year service life of this type of equipment, humidity can penetrate into it and alter the ability of the broken-down SF6 to recombine. When the humidity content of the gas reaches certain levels, the sulfur and fluoride begin to form highly toxic and corrosive products such as sulfur dioxide (SO2), hydrofluoric acid (HF), and disulfur decafluoride (S2 F10). These compounds not only decrease the amount of dielectric insulator but also create an acidic environment that attacks and damages the internal surfaces of the gas tanks and can compromise safety. Therefore, it is imperative to monitor and control humidity levels in the SF6 to ensure the gas has not degraded, and it still provides proper insulation. With the growing development and ubiquity of smart grid and online monitoring for power plants and transmission and distribution operations, continuous and digital monitoring of gas humidity content is replacing the less convenient and costlier practice of gas moisture analysis at defined intervals. Continuous online monitoring does not require switching off the equipment and also avoids the added expense of transporting personnel and instrumentation for onsite measurements. With continuous monitoring, trends are easily identified, leading to better planned, targeted maintenance based on equipment conditions. This proactive monitoring decreases risk of failure, reduces operating costs, and ensures safe operations. 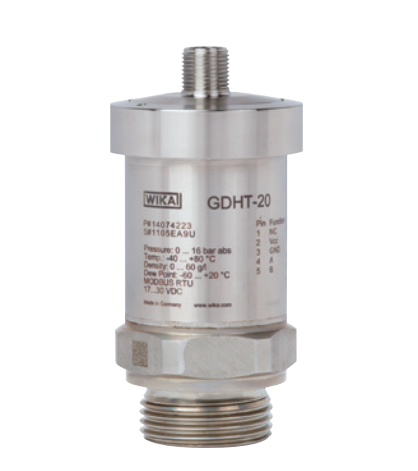 WIKA has a complete line of instrumentation for SF6 and has developed a multi-sensor, all-in-one transmitter to measure gas temperature, pressure, density, and humidity. The GDHT-20 is a compact, comprehensive system with digital output that allows continuous monitoring of all relevant gas condition parameters. It uses high-accuracy sensor technology and features ingress protection IP65. The long-term stability of its signal makes the GTDH-20 maintenance free, with no recalibration required. The EMC characteristics of the GTDH-20 guarantee interference-free data output. The system’s interface communicates using the MODBUS protocol, minimizing programming and wiring costs, and providing easy integration with smart grid monitoring equipment. Keeping an eye on the conditions of the gas through the continuous gas parameter monitoring provided by the GDHT-20 helps improve plant safety. It also helps reduce inventory and streamline infrastructure, promoting more efficient operations and maintenance. The GDHT-20 combines advanced technology with a robust design. It provides the reliable, high precision, continuous digital measurement of gas humidity content you want to ensure the integrity of the SF6 insulator of your equipment and the safety of your plant. Contact WIKA’s experts today to learn more about the benefits of incorporating this system to your plant.